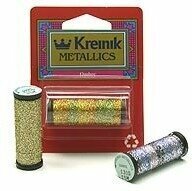 Kreinik Ombre is an 8-ply, softly twisted metallic thread. It is available in nine variegated colors as well as solid gold, silver, and pearl to add a fuzzy texture to Cross Stitch, Needlepoint, Knitting (makes a great companion to use with your favorite yarns) and Machine Embroidery. Available on 15 meter (17 yard) spools. $2.29 On Sale for Only $1.76! !